March 8, 2018 (San Diego's East County) - This week’s Destination East County includes a Plein Air art show in Borrego Springs, mountain men at the Laguna Mountain Rendezvous, Tomatomania at the Water Conservation Garden, a lavender farm brunch and more. Plus, we’ll have a preview of coming attractions including the Alaska String Band in concert, the Bunny Train in Campo, a Spring Extravanza at Santee Lakes, Spring Harp Fest in La Mesa, Saps at Sea comedy films in Spring Valley, Sweet Pea Day at Summers Past Farms, the Peg Leg Smith Liar's Contest, Meet the Winemakers Weekend in Ramona, the Cajon Classic Cruise season opener, an antique fair in Flinn Springs, and the San Diego Festival Chorus and Orchestra’s spring concert. March 2, 2018 (La Mesa) – Nainsook Framing + Art invites you to “Glow,” a spring artists’ reception on Saturday, March 3 from 6-8 p.m. The event features works by local artists Beverly Berwick, Mary Sue Compton, Gary Dyak, Tina Fries-Miller, Sue Z. Gold, Susan Hewitt, Roberta Labastida, Harriet Lisak, Carol Mansfield, Ann Slater, Paul White and Jami Wright. Wine and cheese will be served at the reception, which is open to the public. The art show will run from March 3 through April 30. February 22, 2018 (Ramona) – You’re invited to meet artists, art teachers, furniture artisans and celebrate the life of the late, great artist Helen Petre on Friday, March 2 from 6-8 p.m. at the 2Create Gallery, 438 Main Street in Ramona. The event is the first of a series of “First Friday” art events that the gallery plans to host, each featuring art, music and refreshments. Helen Petre was a colorful and acclaimed artist who lived in Julian and continued creating works of art well into her nineties. Known for her stylish hats and fashionable clothing that she designed herself, during her long and productive life she became a prolific artist excelling in collage, monoprinting, mixed media and bookarts. November 18, 2015 (San Diego) – The paintings of Countess Jadwiga “Inka” Zamoyska of Zamość are stunning depictions of nature and portraits with a masterful application of light and shadows to create mystery, dramatic effects and beauty. Her works evoke the style of Rembrandt, the 17th century Old Master famed for his illuminating imagery. Astonishingly, her current portfolio of exquisite portraits, still life, landscapes, seascapes and snow scenes have all been created in the past few years—and next up, this remarkably talented artist has agreed to create a painting of East County wilderness which will be auctioned on November 20th with proceeds benefitting both Grossmont Hospital Foundation and launch of a new special section on East County Magazine covering animal rescue groups and wildlife/animal news in our region. She will also paint a custom animal painting to be auctioned at a December 5th party for the animals, also benefitting our new “Animal Action” section..
September 21, 2014 (Ramona) - Opera and fine art in East County? Bravo! Salerno Winery in Ramona has forged a partnership that’s music to the ears of those who love opera, sculptures and Italian-style wine. Herman Salerno, an opera singer from Italy, and his wife, Rose, founded the winery and began displaying sculptures from a friend’s collection. Now, they have now teamed up with Jaime Chaljon, a Mexican businessman, to unveil an expanded sculpture garden featuring works by over 20 world-renowned artists including Jorge and Javier Martin, Tan Da WU, Julian Bravo, and Pedro Cervantes. The winery is open on Fridays, Saturdays and Sundays, when guests can enjoy not only wine and pizza cooked up in an outdoor oven, but also performances by Salerno and well known Mexican operatic stars. January 6, 2013 (Lemon Grove)--The Lemon Grove Historical Society, in cooperation with the San Diego County Library System, will present a new "Art Talk" showcasing the art of Kathleen Strzelecki on Saturday, Jan. 11 from 2 - 4 p.m. in the Rosemary Putnam Community Room of the Lemon Grove Library, 3001 School Lane. Photo: Grace Schlesier at her show at the Wieghorst Museum in 2012. November 13, 2013 (El Cajon) – Members of the California Art Club’s San Diego Chapter and the Olaf Wieghorst Museum unveiled the “Landscapes of the West” exhibition with a gala opening at the Museum on October 5. The display will be on view through January 11, 2014. Art enthusiasts at the opening enjoyed hors d’ oeuvres and wine, while viewing over 35 juried works by some of San Diego’s finest painters. The event was also coveted by collectors, who appreciated the opportunity to have a first look at the paintings, all available for acquisition. A portion of proceeds from sale of artwork will benefit both the Club and the Museum. Educational programming during the exhibition will include a November 14 presentation by CAC Artist Member Mark Fehlman on California Art Club’s history. Reservations are suggested for the lecture and the reception that will precede Fehlman’s talk, as space is limited. September 12, 2013 (San Diego)-- Saturday evening, October 5 the second annual Mission Trails Regional Park Foundation’s “Art in the Park” will be held. Featured art by more than 40 award-winning artists will be on display and for sale, with over 100 pieces of nature-related art featuring a variety of painting styles, ceramics, photography, and sculptures. Artists will also be in attendance representing their art. CBS8 Meteorologist and lifestyle reporter Shawn Styles, and Mission Publishing Group publisher, Jim Madaffer return as honorary co-chairs for this event in the Visitor Center from 6-9 p.m. Tickets are required. There will also be a silent and a live auction; for $25 guests can enjoy an evening of fine art, fine wine, fine cheese, and fine chocolate (by Xocai healthy chocolate). March 27, 2013 (Rancho San Diego)--Heritage of the Americas Museum is presenting a Fine Art Show and Sale on Friday, April 26with an array of art works that will capture the imagination and inspire. Thirteen artists will mingle with the guests including world-renowned artist and global issues speaker Ray “Padre” Johnson. Additional artists will also be featured; for details on other artists see http://www.eastcountymagazine.org/node/12848. The event includes special music by the Chris Klich Jazz Trio and flautist Jim Hannibal. Wine and beer will be served. Great hors d’oeuvres and desserts will be offered by Cupid’s Catering. Donation is $10.00. Please RSVP (see contact information below). March 9, 2013 (San Diego) – St. Madeleine Sophie’s Center will be the featured special guest artist at the Art Glass Guild’s Spring Patio Show and Sale on Saturday and Sunday, May 11-12 from 10 a.m. to 5 p.m. The largest art glass show in Southern California will be held at Spanish Village Art Center in Balboa Park. All forms of art glass including blown, fused, torch worked, stained glass, cast, etched, and mosaic will be featured. Over 30 juried glass artists will be exhibiting their art. July 12, 2012 (Mission Trails) -- The Mission Trails Regional Park Foundation and the California Art Club will present Treasures of the Mission Trails Regional Park Art Exhibit and Benefit on July 14 from 6-8:30 p.m. Renowned Native American Flute Player Tim Romero will be performing and George Cowles, East County resident circa 1873-1883, will return in character. The event will also include fine art, fine wine, cheese and chocolate. October 19, 2011 (La Mesa) O’Dunn Fine Art will unveil the Ireland Paintings Exhibition by Paul Strahm, a signature treatment that examines the Irish countryside, street scenes, coast and waterways. The collection of 14 paintings will be on display from October 22 – November 27, 2011 and are available for pre-sale. September 28, 2011 (La Mesa) – Bay area abstract expressionist John Krempel and his intriguing collection of oil and acrylic paintings will be in La Mesa Village tonight from 5-8 p.m. for a reception at at O’Dunn Fine Art. The public is welcome to attend, also savoring refreshments and entertainment provided by guitarists Bill Coleman. San Diego Arts Guide will be present to launch its October-December edition, which features a Kempel painting, “Skyscrapers in the Night,” from the exhibit on the cover. September 6, 2011 (La Mesa) -- AbEx invades La Mesa Village! Bay area abstract expressionist John Krempel is bringing a selection of larger oil and acrylic paintings to East County for his exciting show September 7 – October 9 at O’Dunn Fine Art. Art lovers are also invited to meet this talented artist at a reception on Wednesday, September 28 from 5-8 p.m. Influenced by the 20th century San Francisco abstract expressionist movement, Krempel references the beauty of both natural and man-made landscapes in his work. He has been featured in dozens of bay area shows, and is the founder of the Temporary Artists Group (TAG), which brings emerging artists to the community. With degrees in both the arts and psychology, John's paintings dance at the interface of the physical and psychological worlds. August 18, 2011 (El Cajon) – “7 Galleries~1 Evening” will be held this Friday, August 19 from 5-8 p.m. “Come and join us for a fun, short 1/2 block walk, full of Art, champagne, wine, hors d'oeuvres and a "Downtown Gallery Walk" passport full of prizes,” says Lynn Endicott, owner of Silver Creek Fine Art Gallery. July 24, 2011 (La Mesa) – "Last Light," the largest collection of artwork by Wade Cline will be on display at O’Dunn Fine Art in La Mesa from July 27 to August 28. In addition, the public is invited to meet the artist at a reception July 27 from 5-8 p.m.
Cline's oil paintings are mostly moody urban scenes of San Diego, with mid-century architecture, rainy streets, and that” low energy time right at dusk,” O’Dunn said. Influenced by Wayne Thiebaud and Edward Hopper, Cline has exhibited at the Crocker and Barrios art galleries in Sacramento, the Pratt and La Jolla Artists' galleries in San Diego, and in "Art Alive" at the San Diego Museum of Art. June 17, 2011 (La Mesa)--What is your image of summer? Being on the water, a back country visit, ripe grapes in the sun? We all have nostalgic and joyful memories of summers past, and hopes for relaxation, recreation and friendship in the months ahead. "Images of Summer" at O'Dunn Fine Art in La Mesa will present--in the vernacular of painting--sunny days of over twenty artists, in oils, watercolor, and pastels. Landscape, figurative, and abstract pieces evoke the season, each framed and ready to hang. Proprietor Shannon O'Dunn invites you to join her for the opening of "Images of Summer", and to celebrate the Summer Solstice with music and art on Wednesday June 22, from 5 pm to 8 pm. June 15, 2011 (El Cajon) -- Art lovers are invited to stroll through "6 Galleries-1 Evening" in a "Downtown Gallery Walk" on June 17 from 5-8 p.m. All six galleries are now located within a half-block in the heart of downtown El Cajon. In addition to savoring art by local artists, visitors can also sip champagne and wine, enjoy hors d'oeuvre's and a passport full of prizes--followed by a free concert in the park. March 24, 2011 (La Mesa) -- To celebrate two years in business, proprietor Shannon O’Dunn has announced her gallery will host an all-day event featuring special savings on Thursday, March 24, 2011. All are welcome. Three California fine artists have recently joined with O’Dunn Fine Art for representation, furthering the gallery’s role and reputation as an attractive venue and outlet for high-quality fine art in East County. January 24, 2011 (El Cajon)--The Grossmont College Hyde Art Gallery, located on Grossmont College’s campus in El Cajon, is presenting an exhibit of 24 wall panels featuring natural materials that display rain patterns that fell on campus during the 2009-2010 rainy season. The exhibit, called “Rain Events and Related Investigations", was created by Grossmont College art faculty member Jim Wilsterman. The exhibit, which is free and open to the public, runs from January 24-February 24. December 17, 2010 (La Mesa) – “Food, wine, art and a chance to talk with local people who are going about making the world a better place, one village at a time…what could be more in the holiday spirit?” asks an invitation from Shannon O’Dunn, owner of O’Dunn Art in La Mesa. Tonight from 5-7 p.m., she will host a wine-tasting event to benefit H.U.G.S. (Helping Ugandans Grow Stronger). The organization is raising funds to build a bakery in western Uganda that will provide jobs for women and girls in this impoverished area. December 5, 2010 (El Cajon) – Wings and Snow, an annual holiday celebration featuring holiday art, seasonal gifts and angelic dolls by artists with developmental disabilities, will be on display throughout December and January at Sophie’s Gallery & Gift Shop. 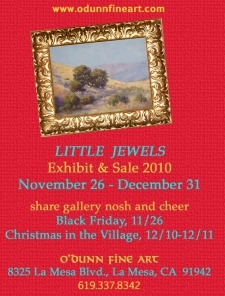 November 20, 2010 (La Mesa)--Holiday offerings of smaller paintings priced for gifting is a tradition in the art world; many galleries feature shows entitled "Little Gems", "Holiday Miniatures Exhibit", and the like. October 5, 2010 (El Cajon) -- Artwork created by faculty members of the Grossmont College Art Department will be on display through Oct. 28 at the Hyde Art Gallery, located on campus. The public is invited to view the exhibition of approximately 55 pieces from 29 different art department instructors. September 11, 2010 (El Cajon ) - The 21st Invitational Art Exhibit at St. Clair Gallery, featuring over 165 pieces of fine art, runs through September 17. An artists’ reception will be held on September 12 from 3 to 6 p.m. Admission is free.